Fast Lap is easy and fun track event for cool people who love cars and like to ride it fast. Moto is "Racing for fun since 2008!". 0) Practice takes time in the morning, it's open pitlane for all drivers for 2 hours. 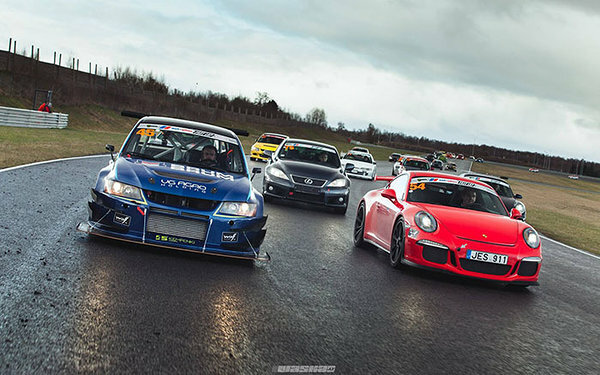 1) Time Attack is two time sessions (total in 50 min) where you're fighting among 90 drivers with your best lap time in 8 classes. 2) Wolf Oil Race is touring car racing for the position with qualification and two 8 laps runs. 60 cars expected in R1600, R2000, R3000, R3000+ classes. It is open event for all car enthusiasts. Estonians, as any other foreign drivers can register to both formats. There are no limitations for entry in Time Attack only from few (Street class) to some (PRO) safety requirements, which are super easy to fit. For Wolf Oil Race, as it is higher format status, drivers need to present their ASN racing licence. And R1600, R2000, R3000 has mono tyre requirement of Nankang AR-1, while R3000+ tyre choice is free.